Microsoft has released the Visual Studio Team Foundation Server 2013 Power Tools. One of my favorite and useful (Thanks Gilles) command that the power tools allows us to do is the Undo Unchanged. When you checkout a file but not make any changes, by default, Visual Studio will commit the file, but you can remove automatically all these unchanged checkout files with one action. The Visual Studio team at Microsoft has been working very hard to release Visual Studio 2013 (and all tools around) on time. S. Somasegar has published this morning at 4 AM (PST) a blog post to announce the online availability of the last version of your favorite IDE. So if you have an MSDN subscription you can download today Visual Studio 2013 and Team Foundation Server 2013 from your MSDN Subscription Download page. If you don’t, no need to worry, you can download for free the Express edition of Visual Studio 2013. I have been playing a bit with the RC version and one of the feature I like (besides all the amazing work done by the ASP.NET team) is the possibility to link your Microsoft Account to Visual Studio. Save the date! On November 13th, Microsoft will host an event for the launch of Visual Studio 2013. Today is also the official release of Windows 8.1 and Windows Server 2012 R2. You should be able to download the update for Windows 8.1 directly from the Windows Store. I haven’t done it yet since I have downloaded the full version from my MSDN account, but I’ll try to install it on another computer using this process. Read the official blog post from the Windows team for the release of Windows 8.1 and Windows Server 2012 R2. A lot of new products this week! From the operating system to the development tools, everybody will have a great weekend, downloading, installing and playing with the new products 🙂 Microsoft has released this week the Release Candidate of Visual Studio 2013 with a Go-Live license. In other words, you can use Visual Studio 2013 RC for production purposes. The RTM version will be released on October 18th. This new version of the development environment brings a lot of new features around the XAML editor, the business applications, TFS… For more information, I invite your to read the post of Somasegar – Announcing the Visual Studio 2013 Release Candidate. Download Visual Studio 2013 RC. More quietly, Visual Studio 2012 Update 4 RC is also available. This small update will be the last one for Visual Studio 2012 and brings only bug fixes. The RTM is planned for the end of the year and more release candidate are expected. I recommend you not to install this update except if it fix a critical bug that is blocking you. Download Visual Studio 2012 Update 4 RC 3. And here is the KB that explains what’s new in this update. Download Windows 8.1 and Windows Server 2012 R2. If you want to have a quick overview of all the work done by Microsoft for any products, I highly recommend to look at the Keynote Day 1 and Keynote Day 2. In the last months I’ve been working a lot on Web development projects (using MVC Razor) and looking at the next IDE, I can’t wait to get the final build. Beside the fact that the Web designer has been rebuild from scratch which make the evolutions much easier, the integration with Windows Azure has been improved and you’ll be able to control almost everything on your cloud account with Visual Studio. Download Visual Studio 2013 Preview today and try the new features of the IDE. For those using Visual Studio 2012, the Update 3 has also been published but very quietly. IDE, the Blue theme if VS 2010 is back. To learn more about the details of each improvement or features, please read the KB2797912. You will note the come back of the Blue theme of Visual Studio 2010, that was the top requested feature on the Visual Studio UserVoice. But, are you really going to use it? On my side, I’m using the plugin Visual Studio 2012 Color Theme Editor with the theme Dark with Light Editor. I’ll install the Update 2 of Team Foundation Server later today. Do not hesitate to send your feedbacks on Visual Studio UserVoice, Microsoft is using it a lot to improve their tools. It would be silly not using it. And of course, Microsoft Connect to report bugs. Microsoft and the Visual Studio ALM team released last week the Microsoft Visual Studio Team Foundation Server 2012 Power Tools. 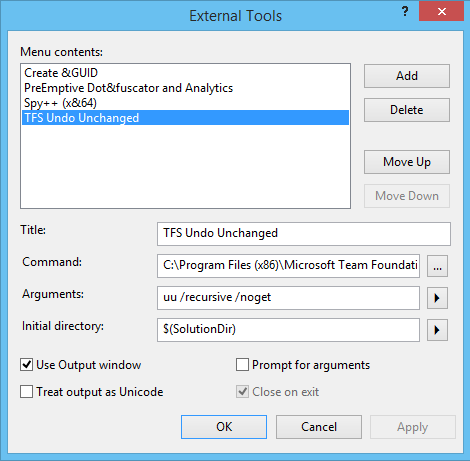 It’s time for you to install them if you’re running Visual Studio 2012 with TFS 2012. One of my favorite and useful command that the power tools allows us to do is the Undo Unchanged. When you checkout a file but not make any changes, by default, Visual Studio will commit the file, but you can remove automatically all these unchanged checkout files with one action. Microsoft is performing a service maintenance on TFS Preview (TFS hosted on Azure) today. So you’ll probably notice this error message when trying to connect: TF30040: The database is not correctly configured. Contact your Team Foundation Server administrator. The service should be back online very soon and the maintenance will be done by Friday 27th 9 AM PDT. I suggest you to follow the account @tfservice on Twitter and the blog TfService for the last updates. Today is a big day event for the Microsoft community, but not only for the developers. Microsoft have released early this morning Windows 8 Consumer Preview and the Visual Studio 11 Developer Preview. I installed it today on the Samsung tablet Microsoft provided to the BUILD attendees in September 2011. I didn’t find out how to install directly Windows 8 from the USB key, so I had to start it from the previous Windows 8 and then remove the old Windows. The installation is very fast, in less than 30 minutes, no manual action, I was on the new Metro interface. Yes I say new, because the interface is a bit different than the previous public version, it seems more smooth, clear. Download Windows 8 Consumer Preview. The next step was to install Visual Studio 11. It was, at my astonishment, a very fast installation, considering that Expression Blend 5 is part of the package. The first impression is, wow! On the tablet Windows 8, the theme of Visual Studio is very bright, and I don’t think I’ll like to develop anything on it. It looks like Expression Blend. What do you think? Live me you feeling about this new design of the interface. I like the dark theme so far, but if you look at the Solution Explorer, the icons are not very easy to distinguish. But I guess after using it more and more I’ll get used to it. The last screenshot I would like to show you is the interface of Expression Blend 5 that is included in the installer of Visual Studio 11.